Spider veins are veins that appear on a person’s legs and are similar to varicose veins only that they are smaller. What also differentiates them from varicose veins is that they are usually close to the surface of the skin. These stockings help in putting reasonable pressure on your veins. They come in 3 types and they are support pantyhose, over-the-counter gradient compression hose and prescription-strength gradient compression hose. They all offer different degrees of pressure on the legs. This is whereby a doctor injects a liquid chemical into the vein. This chemical makes the vein to swell, stick together and seal shut. The vein turns in scar tissue because the chemical stops the flow of blood in the veins. After some few weeks, the scar usually fades away and you have your wonderful skin back once more. This is the most common treatment for spider veins on legs. This effective method sends strong bursts of light to the vein. The light usually makes the veins to slowly fade away. There are no incisions that are made on the leg but only light from the laser. This is a natural way you can use to get rid of spider veins. You can do this by exercising daily and it does not have to be vigorous exercise. You can do this by engaging in low intensity activities such as taking a walk daily and doing some house chores. Being overweight puts a lot of pressure on your legs which leads to spider veins. Therefore, it is important that you lose weight and have a body weight that will not apply pressure on your legs. This is a very simple and cheap way. Having massages is a way of ensuring that there is constant blood circulation in the body. Good blood circulation is a way you can use to get rid of spider veins in your legs. It is a very cheap Treatment for spider veins on legs. • When sleeping, you can put a pillow under your legs so that you can ease pressure on your legs. Sleeping on your back increases body circulation thus getting rid of spider veins. •We also think it is worth checking out thread vein treatments at Dr Newmans Clinic they offer a range of treatments to combat vein related blemishes. • You can increase the uptake of antioxidants in your diet. Antioxidants play an important role in keeping your veins strong and healthy. • Get more citrus bioflavonoid complex in your diet. They play an important role in strengthening the walls of veins. You can get this complex from oranges and grapefruits. • You have to ensure that you take part in leg toning exercises. This includes going for jogging once a day to increase circulation and this will enable you to get rid of your spider veins. • You can apply apple cider vinegar on your spider veins. This is a favorable home remedy that will help you reduce spider veins easily. When using sclerotherapy you can get stinging red and bruises which might result from the injection received. The bruises might be painful, but for a very short period. You can also get lumps of blood that accidentally get trapped in the vein and this causes inflammation. However, this is not very dangerous and you can take care of this problem by taking aspirin. Your doctor can also treat this problem by draining the lump of blood. When using the laser treatment, the heat from the laser is usually quite painful. However, cooling the surface of the skin reduces the pain very fast. 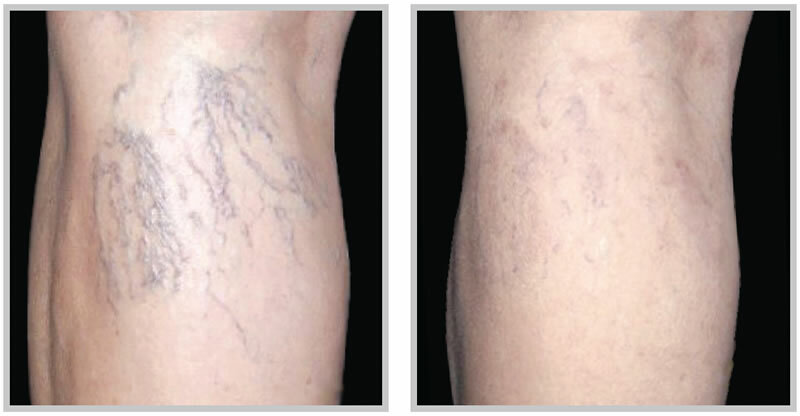 veno rid serum works to improve spider veins and with regular application they are reduced. I am a massage therapist and I tried it and I have been happy.